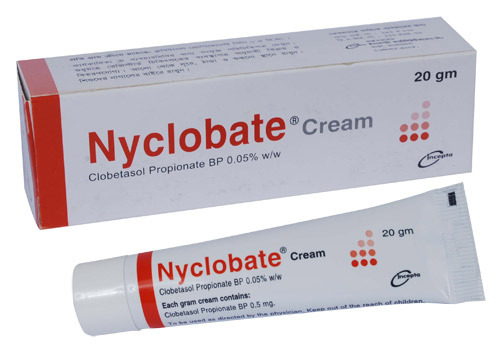 Nyclobate Cream: Each gram cream contains Clobetasol Propionate BP 0.5 mg (0.05% w/w). 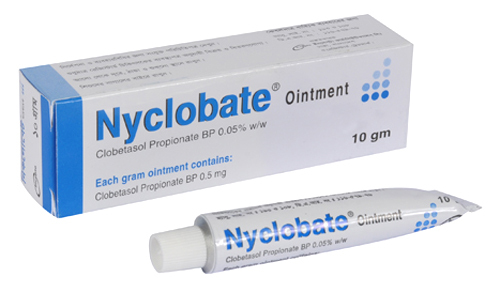 Nyclobate Ointment: Each gram ointment contains Clobetasol Propionate BP 0.5 mg (0.05% w/w). 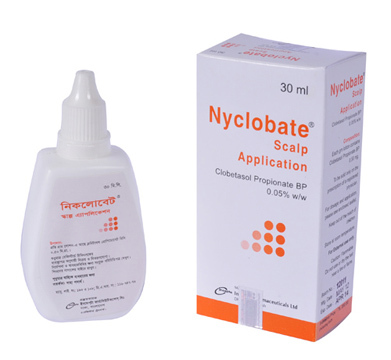 Nyclobate Scalp Application: Each gram lotion contains Clobetasol Propionate BP 0.5 mg (0.05% w/w). 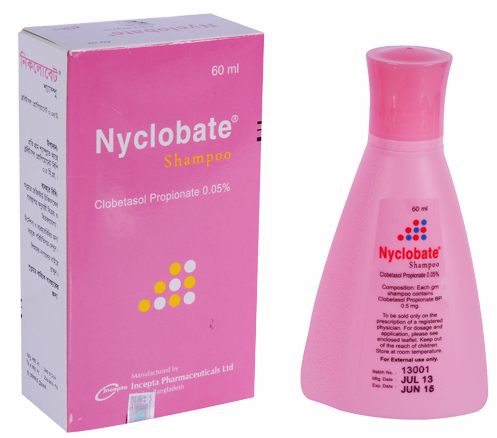 Nyclobate Shampoo: Each gram shampoo contains Clobetasol Propionate BP 0.5 mg (0.05% w/w). 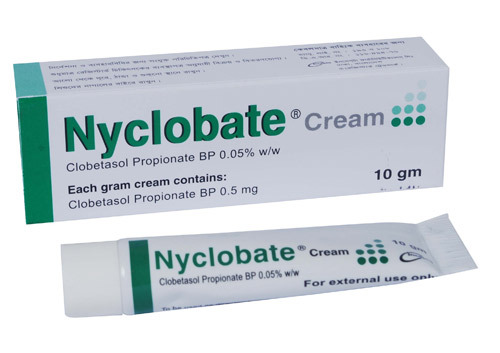 Clobetasol Propionate is a highly active corticosteroid with topical anti-inflammatory activity. 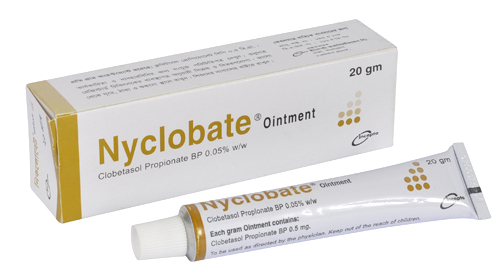 The major effect of Clobetasol Propionate on skin is a non-specific anti-inflammatory response, partially due to vasoconstriction and decrease in collagen synthesis. • Apply sparingly to cover the affected area, and gently rub into the skin. Frequency of application is 2 to 3 times daily according to the severity of the condition. The total dose applied should not exceed 50 g weekly. • Treatment should not be continued for more than 7 days without medical supervision. If a longer course is necessary, it is recommended that treatment should not be continued for more than 4 weeks without the patient\\\'s condition being reviewed. • It should be applied to the affected scalp areas twice daily, once in morning and once at night. • Total dosage should not exceed 50 ml per week. Children: Under 1 year this preparation is not recommended. • It should be applied to the dry (not wet) scalp once a day to the affected areas only. • It should be massaged gently into the lesions and left in place for 15 minutes before lathering and rinsing. • Treatment should be limited to 4 consecutive weeks. • Total dosage of shampoo should not exceed 50 g per week. • Under 18 years this preparation is not recommended. Generally this preparation is well tolerated. However, few side effects after prolonged and intensive treatment may cause local atrophic changes in the skin such as thinning, striae, and dilatation of the superficial blood vessels, particularly when occlusive dressings are used, or when skin folds are involved. Long-term continuous topical therapy should be avoided where possible, particularly in infants and children, as adrenal suppression can occur readily even without occlusion. If used in childhood, or on the face, courses should be limited to 5 days and occlusion should not be used. If applied to the eyelids, care is needed to ensure that the preparation does not enter the eye. If used in psoriasis careful patient supervision is important. Scalp Application: Keep away from eye. Flammable. Do not use or dry the hair near a fire or flame. Scalp Shampoo: Do not use on areas other than the scalp. Keep away from eye. Pregnancy category C: The safe use of this preparation during pregnancy & lactation has not been established.